Take a bowl. Add corn kernels, salt, basil leaves(crush it with hands), black pepper, salt and mix it well. 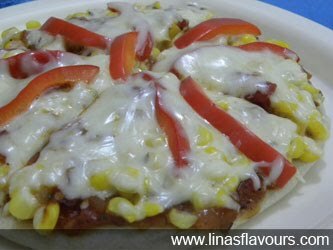 For Pizza - Take a base and spread pizza sauce, spread half of corn mixture and sprinkle half of cheese on it. Finally, top it up with julienne of red/green peppers.